I cannot be understood at all on this earth, for I live as much with the dead as with the unborn. Somewhat closer to the heart of creation than usual, but not nearly close enough. But a storm is blowing in from paradise, it has got caught in his wings with such violence that the angel can no longer close them. ~ Walter Benjamin, writing upon Klee's death in 1940 about Klee's Angelus Novus. This Star Teaches Bending is Vancouver sound artist Mathieu Ruhlmann's audio documentaton of the corporeality and spaces of his mother's final days in 2012. Valerie Joy was diagnosed with a lung disease that introduced into her life the battery of machines the dying are often tethered to at the end of days. Anyone who has been present in those rooms, and sat cumbrously amid their hoses, lines -in and -out, and medical monitor displays, knows these sounds in a visceral way. Ruhlmann chose to capture them with pickups and mics, offering them here as the music of aspirations, deep-throated rattles, amplified emptied stomach and, widening the frame, footfalls, banal traffic noise, and the continual presence of room tones. The sounds might be regarded as an audio death mask, their traces and resonances at once discomfiting and entirely abstract. Ruhlmann selected as titles for his five tracks titles Paul Klee gave some of the paintings he made in his final year of life. 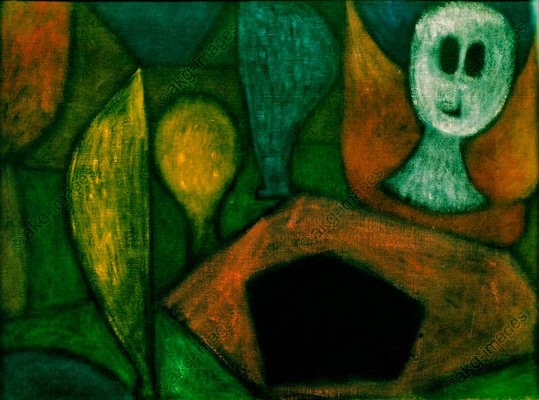 There is, in Ruhlmann's brief note about Klee found inside Akos Garai's beautifully designed CD booklet, a sense of admiration for Klee's five year-long dedication to making art while suffering an illness without a cure - more precisely, suffering purposefully, as the last paintings and works on paper reveal. This Star Teaches Bending joins a growing number of releases of abstract music issued from a musician's personal losses - notably, Tilbury and Rowe's Duos For Doris, Jason Kahn's Vanishing Point, Jason Lescalleet's The Pilgrim - and may well generate fruitful conversations about the fact that a document like this exists at all. It is, of course, a terribly intimate listening experience, bringing Valerie Joy's dying out of the isolation of those rooms, with that equipment that sounds like it owns a life coterminus with her own. Ruhlmann's documentary of the magnified sounds of his mother's living-into- dying might well stand as a strong work of abstract music heard sans the personal narrative. I'll never know - I first heard it upon arriving home in July 2013 from Las Vegas, where I spent three days at the hospital bedside of my dying mother-in-law, Lynne. As family gathered amid a battery of blinking, ceaselessly noisy medical machines, Lynne died at age 63, the same age as Valerie Joy. Returning home from that experience, I found a package from Ruhlmann in the post; This Star Teaches Bending may well have been the first music I heard just days after Lynne's death, I can't recall. I cannot pretend to hear it unmoored from that experience. This star has taught Mathieu Ruhlmann to bend himself to a most personal, most ordinary, experience, the loss of a beloved, which he offers here as truly extraordinary music.